Sweaty selfie. 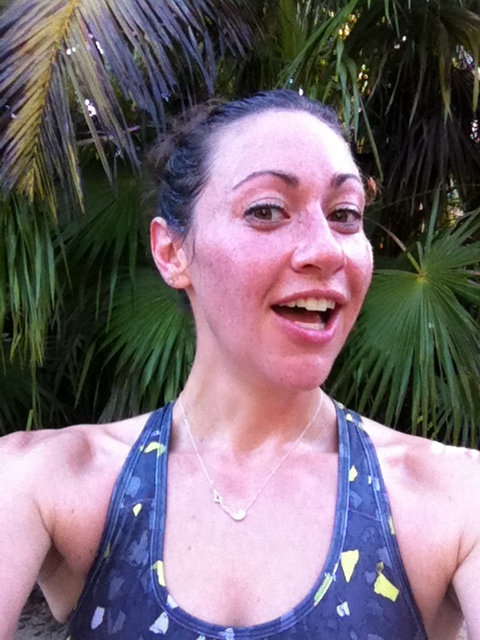 Mid-run in the jungle in Tulum, Mexico. It started with a couple of crazy friends and a challenge issued by Runners World magazine: Run one mile every day between Thanksgiving and New Year’s. So, we started with a hilly 8 miler before turkey feasting and kept the streak going—a mile here, two miles there, nights on the treadmill, extra laps around the park after boot camp. There were days when I wanted to do anything but lace up my sneakers and run, but missing a day was simply not an option. As the miles added up my motivation increased, too. At some point I realized I might actually complete it. Then I realized I might hit 100 miles in the process. I spent the last week of the year streaking through the Yucatan Peninsula in Mexico, going for excessively sweaty beach runs and dodging buses on the crowded streets of Merida’s old city. In the end I only missed one day: December 27—my 30th birthday—which I spent scuba diving, rainbow-watching and getting engaged. When it was time to tally up my holiday run streak, I’d clocked 102.25 miles, honestly more than I ever thought I was capable of doing. And then something crazy happened: I decided to keep going. A few of the same friends started a new challenge: Run 1,000 miles in one year. Yes, that sounds like a lot, but it works out to about 2.8 miles per day. Yes, that also sounds like a lot, but it means I can take days off and rest when I need to—as long as I makeup the mileage later. Counting most of my month of holiday streaking, so far, I’ve run 136 miles. Just 864 miles to go. You absolutely should! And in my experience, tracking your progress makes a huge difference. I get so much pleasure out of logging miles, that when I skip a day, I miss it.